-subtle and persuasive study of how the Japanese texts betray both the feudal past and the longed-for modernity. Insightful analysis of Natsume Soseki's Kokoro and its critical reception. 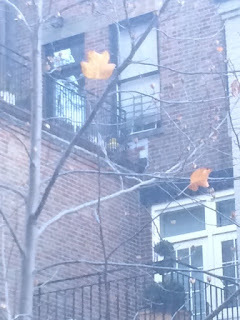 - a most subtle tripartite structure: like a haiku? -too much exposition but memorable characters. Watched this Athol Fugard play last night with my XI's at the Signature Theater. A powerful play and a powerful production, directed by the playwright himself. Set in a tea room in the provincial South African town of Port Elizabeth in 1950, the presentation modulated subtly throughout until it closed in a painful act of disavowal. Hard-hitting performances by Leon Addison Brown (Sam), Sahr Ngaujah (Willie), and Noah Robbins (Hally). Watched last night the terrific move The Dinner (2014), based on a novel by Herman Koch. Directed by Ivano de Matteo, the movie demonstrated, almost inexorably, the fragile foundations of our morality. Great acting from an all-star Italian cast: Alessandro Gassman, Giovanna Mezzogiorno, Luigi Lo Cascio, and Barbora Bobulova. 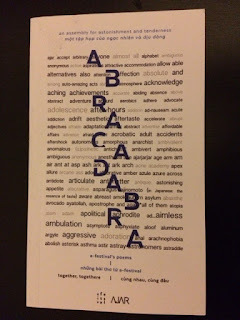 So pleased that my poem "Attribution" from STEEP TEA has been translated into Vietnamese and published by AJAR Press in ABRACADABRA, the publication of A-festival in Hanoi in August 2016. Thank you, Nha Thuyen, and congratulations on the successful inaugural festival! At the end of his third collection of Odes, right at the "back" of the bookroll, Horace placed a poem which, for 2,500 years, has remained the locus classicus of poetry's unique powers: "exegi monumentum aere perennius" (I have completed a monument more lasting than bronze - although every word requires a scholar's note). More durable than bronze, higher than the pyramids, immune to time and the elements. Horace's poetry guarantees that he will not wholly die ("non omnis moriar"). Thursday evening, Oct 27, it was lovely to hear George Kalogeris read his poetry again. Friday, Oct 28, bright and early at 8 am a thought-provoking seminar "Poetry and Translation": Marco Antolin's "Overcoming the Abysm of Creative Stagnation: Philip Levine on Translating Antonio Machado, Garcis Lorca, and Cesar Vallejo"; Mary Maxwell's "Correspondences: Baudelaire's Fleurs du mal and the Translation Tasks of Richard Howard and Walter Benjamin"; Diana Senechal's "Translating an Understanding of Poetry Itself: Tomas Venclova's 'Pestel Street'"; Nicholas Pesques' "Translating: Acting".